i usually try to wrap the tabs around needlenose plier jaws and twist them off, then use a grinding wheel or file on whatever is left. Thanks for the strip down and report on the battery packs dchomak. Nice work. Yup, I’ve used all the methods mentioned, not real happy with any of them. You can see my dremel grinder work(lol) on the below battery top removing the remnants of the spot welds. 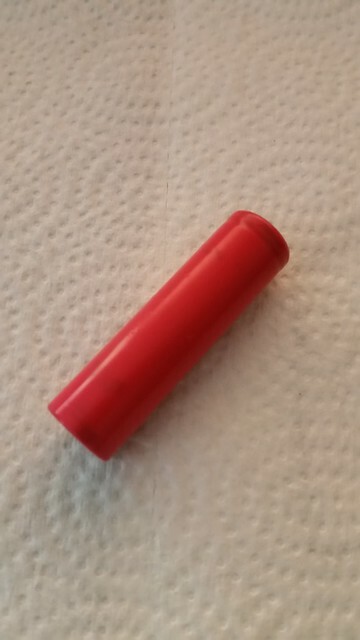 Anyone know what battery this is, I’ve harvested them from a tool pack or laptop, don’t remember what pack it came from. I am electronics tech in MD and have a question about the OP4026 pack. The charger has 3 wires and I have read that the pack cannot be charged through the main power output terminals. Don’t really believe this so, but since I don’t have a good charger I cannot explore what it does. So how can the battery be charged without opening it and doing it the manual way? What is the 3rd terminal? There are 4 terminals on the 40V packs. They are + and – on the outer edges and Temperature sense (+), TS(-) on the two inner terminals. Check with a voltmeter if you can read any voltage on those 2 outer terminals. The microprocessor controls two big FETS on the end of the pack that must be turned ON in order for the normal charging and discharging to occur. If you can’t detect voltage on the 2 terminals, then the FETs have been turned off for some reason and you won’t be able to charge without taking the screws out and getting to the cells directly. Many packs i have found have had good cells, just something stupid like a bad solder joint caused a lack of feedback signal and the micro shut it down for safety reasons. That is actually a good thing. If you are electrically trained as indicated, then you could check all the cells with a voltmeter and only charge the low one(s) and be very careful not to overcharge because they can burn your house down if they go thermal. When you bypass the microprocessor you are taking a big risk that only you can manage. If all the cells are at the same level then the micro should turn on the FETs, but if it doesn’t, then that is the clue to you that there is a defect on the board. i have a schematic for the board but we have not identified the microcontroller chip and haven’t extracted the firmware yet to know how it really works…Be careful. OK, thanks. So the thing to do is equalize the low cells and or determine why they are low. A charger will charge the pack with just the power terminals if the pack is normal but just needs charging? If you see fit I would love to have a copy of the sch. I find stuff all the time in the recycle bins. Here are a couple of finds that are a little bit different. I looked up the brand of the power bank, “Eachine” and found lots of vendors selling them, price around $30. Strangely the reviews were mixed, split between 5 stars (good) and 1 star (bad). Almost all of the 1 star reviews said it worked great at first, then died. When I opened this one up I did find it contained 2 – 26650’s, branded “Wintonic” Never heard of that brand so I wasn’t too hopeful the cells would be any good. The pack was NG, that I knew. Turns out it was the power board that went bad, so there was some hope for these cells after all. Maybe that was the reason for all the 1 stars. That would mean these cells would be lightly used and in good shape. They were sitting at 3.6V when I rescued them. “Wintonic INR 26650” rated at 5000mAh each. Now I know where they got that 10,000mAh rating, copied it off the cell wrappers! Also notice that these 2 cells are “INR” (IMR) type. 5000mAh for an INR would be great! Next thing to do is charge them up on my OPUS and do a discharge test. Also recently I came across a new DeWalt 20V battery and USB battery adapter. They were plugged into each other and in a clear bag thrown into the recycle bin. I figured at least one of the 2 were good. Turns out both were good. The battery charged right up and it works! This is an older model, the newer ones also contain a battery level meter. Not only is there a 5V USB output, on the side there is also a 12V output connector. NICE! It just so happens that I had a 5Ah pack. That combo could be rated at 25,000mAh. An awesome power bank in a pinch. I also recently found a power bank in the recycle bin, two of them actually. One was a bit swollen, so I just returned it. The other was a 16000mAh rated one made by Ravpower. The first time I charged the unit it behaved a bit strangely, at least the lights blinking on the top. I used it a bit, and then recharged it, and it seems to behave just fine. I used it a bunch recently as my primary phone charge means. Not sure it still is capable of 16000mAh, but it lasted a fair amount and seems fine. I found this a week or two after I received a 10000mAh unit made by Anker. So the Anker one will be my work travel backup, and the Ravpower for must everything else. Or if I find someone who needs one I would give them the Ravpower unit, but my kids don’t seem to want it. Yes, I found an ANKER too a couple of months ago. Looked like new and charged right up. It is built to look like a smart phone with glass front and all. It is rated at 10,000 mAh and I believe it. It performs really well. It is a mystery to me as to why people throw away such good stuff. Sweet find. Yeah, it's surprising what gets tossed sometimes. I recently pulled a Ryobi 40v charger. It seems to work fine. Yes, I found an ANKER too a couple of months ago. Looked like new and charged right up. It is built to look like a smart phone with glass front and all. It is rated at 10,000 mAh and I believe it. It performs really well. It is a mystery to me as to why people throw away such good stuff. I’ll take a wild guess. They were using cheap usb cables that severely limited charging speed, and blamed the battery instead of the cable. The first time I used my 20k mAh powerbank, it was only charging at something like .1A. I was car camping, and tired, so I gave up and went to bed. The next day I switched cables and the current jumped from .1A to over 2A. You are quite right about cheap charging cables. When I first got my ip\Phone I found some apple cables on ebay for 85 cents each! They only charged the iPhone at 150mA instead of the up to 2000 mA an iPhone is capable of accepting. I generally get up to 1800mA with my original Apple cable. The clones also broke within a week of use. I had bought 5 and cut them in half and threw them away. Found these 2 batteries the other day. The DeWalt was brand new and the Ridgid used. The DeWalt was just under the low cut off voltage of each cell, sitting at 2.57V each. The Ridgid pack would power a tool, but would not take a charge. When I opened it up, it was wet. I kept it on the dash of my car with the defroster running all day as I drove. After that it seems to work fine. As always, I do NOT trust that pack and keep it in the shed. I found this one today. Never saw one quite like this. just 2 leads positive and negative. I can see that there are lots of 18650’s in this. The top has portion where I can see there are no cells, so I am thinking this is some sort of BMS circuit. This pack must charge and discharge just through those 2 leads. When I first checked it’s voltage it was reading 16.50V. I know the pack is labeled 14.8, but that would be a nominal value. 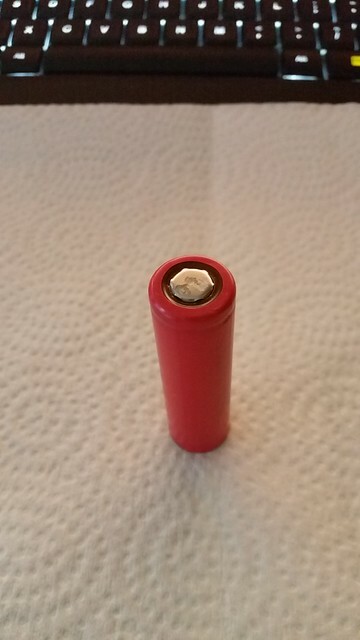 I counted 16 cells through the wrapper, before I cut it open I want to see if I can charge it up. I will do this carefully. I am estimating that this pack is configured as 4S4P. At a maximum of 4.2V per cell fully charged that would mean this pack should stop accepting a charge before then. Will try charging it with my bench supply, if there is a properly functioning BMS the charging should shut down before then. Then I will do a discharge test. This must be an old pack, if it is 4S4P then each 18650 would have been rated at 5600mAh/4, or 1400mAh. Does anybody know what this pack might have been used for? I did a little digging and it goes to a chairlift. my pack seems to performing like new. Now what to do with it. The individual cells are not high enough capacity to warrant salvaging them, and besides the pack works. Here is something different, an old style battery operated lawnmower battery. The white arrow points to the charging port. It looks pretty new and shows no sign of physical wear or abuse. It has a power gauge and it works. I am hoping that this pack contains 2 -12V batteries in series, reconnecting 2 packs in parallel as 12V would be more useful. The output connectors are facing the bottom and it would seem this battery pack would have been inserted into a tray on the mower to connect it. After opening it up I was able to confirm that there are indeed 2 -12V batteries in series. What I will do with this is reconnect them in parallel to deliver 12V and remove the gauge circuit. If I add heavier gauge wires from the charging plug directly to the batteries I can then use the charging outlet for both input and output! A closeup of the charging board that I will remove. The Red and Blue wires that go to the charging port will be connected directly to the 12V configured batteries.